MYKD is pleased to receive the commission for the Terminal East Infill Project at the Austin-Bergstrom International Airport. This arts project is part of the City of Austin’s Cultural Arts Division’s program, Art in Public Places, which reserves a small portion of the budget of every public construction project in Austin to commission public art works. Our project will be located in the new international travel wing of this 55,000 square foot addition. We have chosen to use holographic panels to highlight the ambiguous nature of time when traveling between time zones. 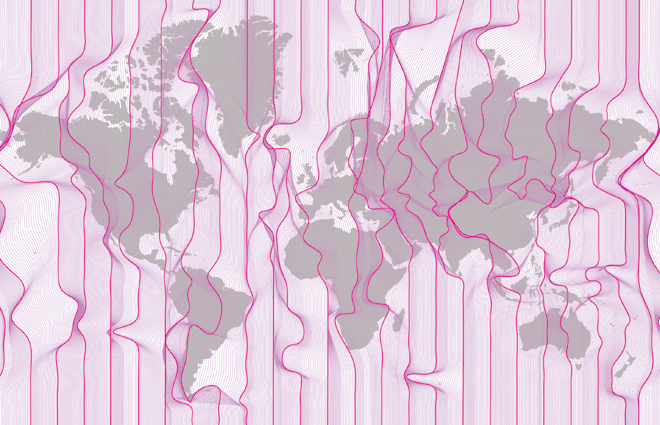 The imagery is developed from the UTC defined time zones in increments of 5 minutes over a 24 hour period, creating a delicate web of lines that represent global time. Through the holographic imagery, three layers of information emerge and disappear in the experience of the art piece. The first layer highlights the UTC time zones as lines with incremental transformations of sky conditions from night to day on the planet. The second layer inverts the night and day relationship and the final layer inserts information about the UTC time zones, Austin airports location geographically and the seven continents.